Product #31111 | SKU MK290XTA3-3W | 0.0 (no ratings yet) Thanks for your rating! 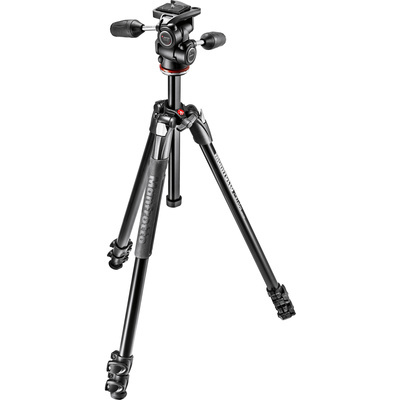 The Manfrotto 290 Xtra Aluminium Tripod with 804 3-Way Pan/Tilt Head extends from 30.5 cm to a maximum height of 171 cm. It weighs 2.5 kg and can hold up to 4 kg of gear. The tripod's 3-section legs have flip locks to individually change the height of each leg. The locks are tension-adjustable to help maintain a tight lock over the tripod's lifespan. Four leg angles allow you to position the tripod in a variety of ways. A rubber grip on one of the legs aids in carrying the tripod, and rubber feet keep it stable on slippery surfaces. The included 804 3-way pan/tilt head features retractable handles, which decreases the overall size when not in use. A built-in spring assists with the tilting motion of the head by compensating for heavier lenses and cameras with off-centre loads. A 200LT-PL quick-release plate is included for quickly attaching and removing your camera from the head. Also included with the tripod is a shoulder bag for added comfort and protection during transport.